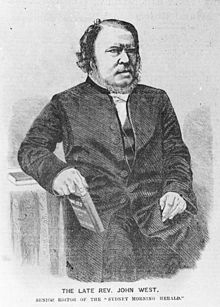 In the opening sentence of the conclusion to his superlative The History of Tasmania, published in 1852, Congregationalist minister, newspaper editor and historian John West wrote ‘The history of Tasmania is a type of the Australian world’. West’s history was a richly detailed, stylishly written and at times polemical meditation on the weird and wonderful world that was Tasmania, then Van Diemen’s Land, and the experiences of Aborigines, convicts and settlers and the interactions between them naturally loomed large. No one who seeks to understand how Van Diemen’s Land functioned as a penal society can afford to ignore West’s History. West was one of our earliest historians, but much has been written about Tasmania’s history since 1852 and there has been an efflorescence of important historical writing over the last three decades that adds depth and new perspectives to the understanding of our past. The Centre for Tasmanian Historical Studies 33rd Annual Conference, to be held in the University of Tasmania’s Life Sciences building on 3 November, provides an opportunity to hear experienced and newly-emerging historians discuss their latest research and thinking about Aboriginal, convict and settler experiences in nineteenth-century Tasmania. Pre-eminent Australian historian Professor Henry Reynolds provides an overview of Aboriginal-settler relations and Malcolm Ward provides a case study of how East Coast settler George Meredith interacted with the Aborigines of that region. Much light has been shed on the convict experience over recent decades and a number of speakers will give a cross-section of recent research on convicts. Our guest speaker, Associate Professor Lisa Ford of the University of New South Wales, discusses the impact of the Bushranger Act in New South Wales. Designed to repress bushranging, the Act also placed white settlers under state surveillance and restricted their liberties. Dr. Dianne Snowden provides insights into the lives of Irish convict women and their children and Alistair Scott explores how Point Puer boys experienced life in Tasmania after their release from captivity. Port Arthur was renowned as a feared place of secondary punishment for convicts and Honey Dower examines how convicts reacted to being placed in the Separate Prison. Rebecca Read adds a new perspective on our understanding of the assignment system by moving from assignment in rural areas to revealing how convicts assigned to businesses in Hobart were treated. The final two papers take us out of the convict period into the later nineteenth century. Rena Henderson focuses on the settler experience in North West Tasmania and in particular explores the experiences of Anglo-Indian settlers at the intriguingly named Castra. Visitors to Tasmania sometimes wrote down their thoughts about the people and society they encountered and Stefan Petrow discusses the wide-ranging and frank views of the young but inquisitive French aristocrat Ludovic de Beauvoir, who visited the island in 1866. Tasmanian Aborigines’ Encounters with Europeans: A Type of Australian Experience? Stand up and stretch time! Henry Reynolds is one of Australia’s pre-eminent historians, a pioneer of Aboriginal History in Australia and the author of many books. His book Drawing the Global Colour Line co-authored with Marilyn Lake and co-published by CUP and MUP, which won the Prime Minister's Prize for Non-Fiction and the Ernest Scott Prize. He is also the author A History of Tasmania (2012). Lisa Ford is an Associate Professor in History at the University of New South Wales. She is author of Settler Sovereignty (Harvard 2010) and co-author of Rage for Order (Harvard 2016). Her work examines the interface among jurisdiction, sovereignty and everyday ideas of order on colonial peripheries around the British Empire and early United States. This paper is drawn from her new book project, The King’s Colonial Peace, which examines how everyday efforts to keep the peace among new and old subjects around the late eighteenth- and early nineteenth- century British Empire produced novel techniques of governance which blended necessity, emergency and military power in new ways. Dianne Snowden is an historian and genealogist. She was awarded a Member of the Order of Australia (AM) in 2017 for significant service to the community as an historian and genealogical researcher, to higher education, and to heritage groups. She was inducted into the Tasmanian Honour Roll for Women in the same year. She chairs the PAHSMA Cascades Community Advisory Committee. She is currently President of the Female Convicts Research Centre Inc., Convenor of the Friends of the Orphan Schools, and President of the Australasian Association of Genealogists and Record Agents. Her recent publications include White Rag Burning. Irish Women Committing Arson to be Transported (Forty South Publishing, 2018) and Voices from the Orphan Schools. The Children’s Stories (self-published, 2018). She is currently working on publications about free children who arrived with convict parents and children in the Orphan Schools. Honey Dower is a graduate of the University of Tasmania and the Australian National University. She is currently a PhD student in the History and Classics Discipline at the University of Tasmania. Her thesis is on the impact of separate treatment on Port Arthur convicts. Rebecca Read is a graduate of the University of New England and the University of Tasmania. She is currently a PhD student in the History and Classics Discipline at the University of Tasmania. Her thesis is on the lash, solitary confinement and work opportunities in convict Australia. Alistair Scott is a graduate of the University of Tasmania. He is currently enrolled as a research Masters student in the History and Classics Discipline at the University of Tasmania. His thesis is on the life courses of Point Puer boys who settled in Tasmania. Malcolm Ward is a graduate of the University of Tasmania and Queen’s University, Canada. He is currently enrolled as a research Masters student in the History and Classics Discipline at the University of Tasmania. His thesis is on East Coast settler George Meredith (1777-1856). Rena Henderson is a graduate of the Central Queensland University and the University of New England. She is currently enrolled as a PhD student in the History and Classics Discipline at the University of Tasmania. Her thesis is on the Preston District, North West Tasmania, 1888 to 2000. Stefan Petrow teaches Australian History at the University of Tasmania. He has published widely on Tasmanian history, specialising in legal and planning history. In 2016 he published (with Carey Denholm) Dr. Edward Swarbreck Hall: Colonial Medical Scientist and Moral Activist and is completing a book called Tasmanian Anzacs: Tasmanian Soldiers and World War One.